The Kalamazoo River Watershed Council is here to help with your questions like, “what is a rain garden anyway?” We also want to give you free resources, so check out the links below and join us for a free talk. A rain garden is meant to mimic nature by allowing rain water to soak into the ground. It’s a landscape feature that’s built to take water from your downspout, driveway, or lawn. It uses special hardy plants that are happy in wet or dry conditions, and can provide great habitat for wildlife and pollinators. Rain gardens can be a Do-It-Yourself option for homeowners dealing with drainage problems on their properties. 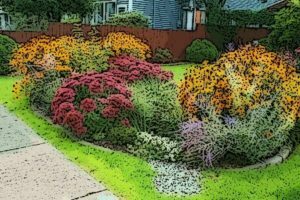 Damp basements, slippery driveways and sidewalks during the winter, and wet spots in the yard after rain storms can often be eliminated with the proper design and installation of a rain garden. Beyond the individual yard, rain gardens filter pollutants out of rain water runoff, slow and cool rain water after big storms, and provide important wildlife and pollinator habitat. Natural landscapes like forests and prairies enable almost all of the rain water to soak into the ground, recharging groundwater (our source of drinking water). Concrete soaks in no rain water. Water that runs off of our roofs and driveways gets polluted by trash, chemicals, dirt, and even heat. This runoff travels directly to streams and rivers through the storm sewer system, which does not filter or treat the water whatsoever. How to I create a rain garden? A rain garden is a simple concept — create a shallow depression where rain water will collect and fill it with plants local to Michigan. But it takes careful planning and some plant knowledge to make a rain garden that is both functional and beautiful. The rain garden guide below will walk you through designing and planting your garden. Want extra help designing and planting a rain garden? Check out our newest program at Kalamazoo River Watershed Council, our Master *Rain* Gardener class. Join us for a short introduction to rain gardens and other sustainable gardening and lawn care solutions. All talks are FREE and open to the public. Special thanks to our hosts. Join us at the Galesburg-Charleston Memorial District Library on Tuesday evening from 6:30 – 7:30 PM. We’ll be talking about rain garden basics and help you evaluate whether one is well suited for your property. Join us at the Vine Neighborhood Meeting where we’ll introduce you to all the benefits of a rain garden and the basics about installing one at your property. Join us at the Kalamazoo Valley Museum for the Sunday Series Lectures. We’ll be talking about rain gardens and other sustainable gardening practices, from rain barrels to community vegetable gardens. Check out the in-depth and in-person training course that will lead you through all of phases of rain gardening — from design and sizing to planting and maintaining. The class is offered at a discounted price (reg price $125) thanks to grant funding and support from our partners at Kalamazoo Valley College and the Kalamazoo Nature Center. Get involved with the KWRC outside of your yard by attending one of our events!